Why is this forum flooded with FORD adverts. 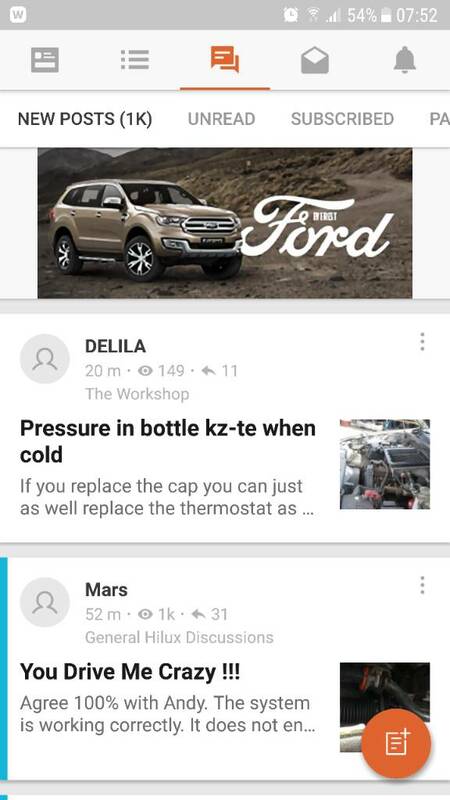 Is it just me or does everyone else also get flooded on this forum with FORD adverts ? Why? I thought this was a Toyota forum? It may have something to do with the Tapatalk platform having their own advertising arrangements. 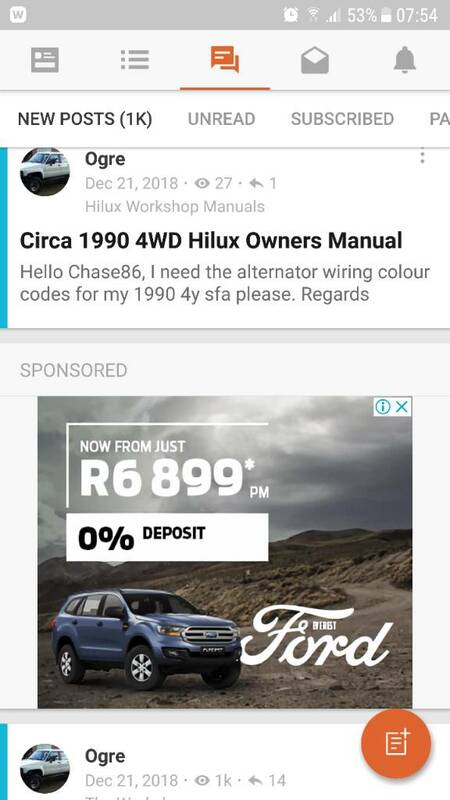 Never seen a Ford ad on the Hilux forum using my desktop PC. Literally every time I page down I get these adverts .......very annoying indeed. Unfortunately I can seem to attach the screen shots.......I'll try that from a different device later. Eish! That would irritate me as well, but the Hilux forum has no control over Tapatalk's advertising preferences. 99.9% of the time I am using my browser on the PC when accessing the forum, so I have never had a need or desire to load Tapatalk on my phone. The few times that I have used the phone to view the forum I have used "Chrome" which is the browser on my phone and to the best of my recollection there were no ads, just a bit awkward to navigate because of the layout on a small screen. Normally they would track your browsing history and see what you have been looking at, showing interest in or getting quotes on. They then tailor the advertisements shown to you in line with your behavior patterns. Do you perhaps have something you need to tell us????? This is exactly how they do it, ads are displayed according to the specific user's browsing history, google searches etc etc.. You can come clean.. you are surfing the net for Fords, aren't ya?? Go to Takealot now and browse for a kettle.. then open News24 or any other site, and you will be bombarded by Takealot ads.. And not just any takealot ads, Kettles.. !! As thys said, ads are displayed according to your browsing history. 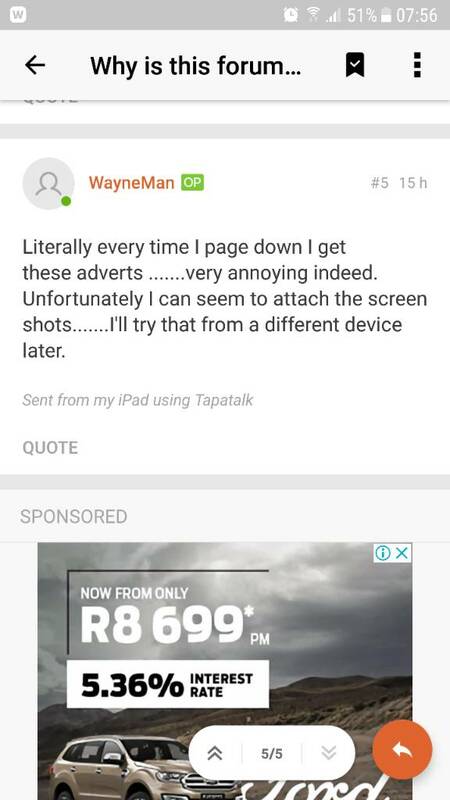 I also do not see those ads, so it must be a tapatalk thing. The web site's latest template is mobile phone friendly so you do not really need Tapatalk to view the forum. 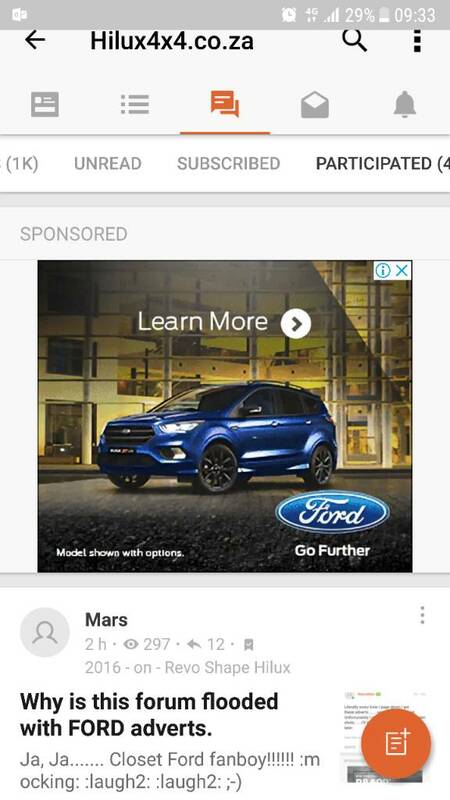 I have never been to a Ford website or forum. I would never touch a Ford with a ten foot barge pole. So I don't think it has anything to do with your browsing history. Ja, Ja....... Closet Ford fanboy!!!!!! 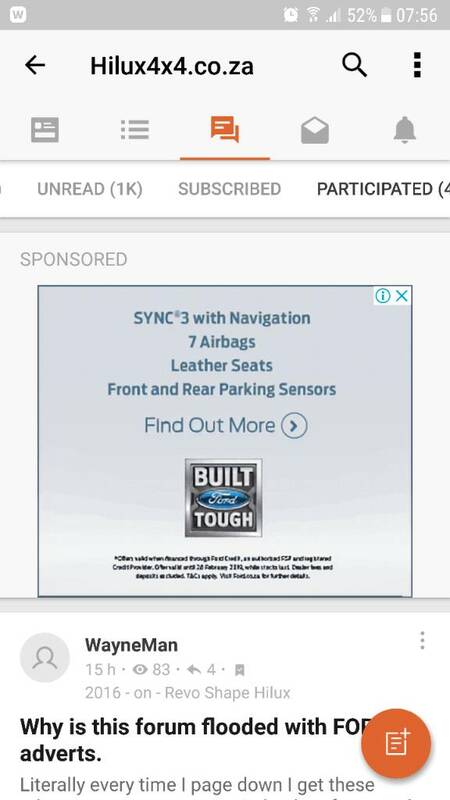 Maybe Ford has bought shares in Tapatalk.